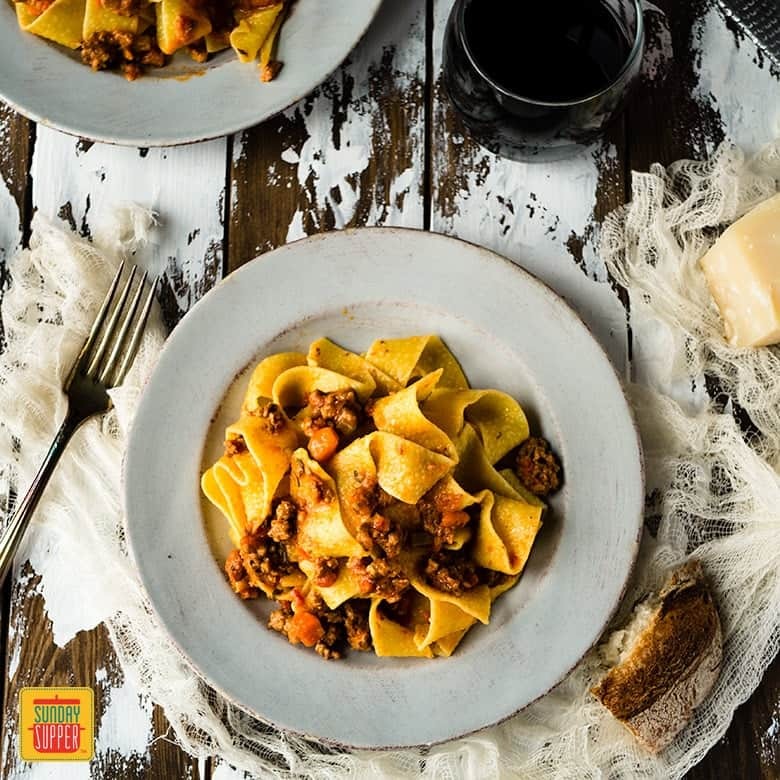 When the air gets crisp and those hibernation instincts kick in it’s time to bring out all the Comfort Food Pasta Recipes. 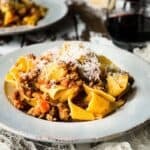 This Pappardelle with the Best Homemade Bolognese Sauce is one for a day when time is on your side. The wide noodles make the perfect vehicle for this rich, savory authentic Italian meat sauce. 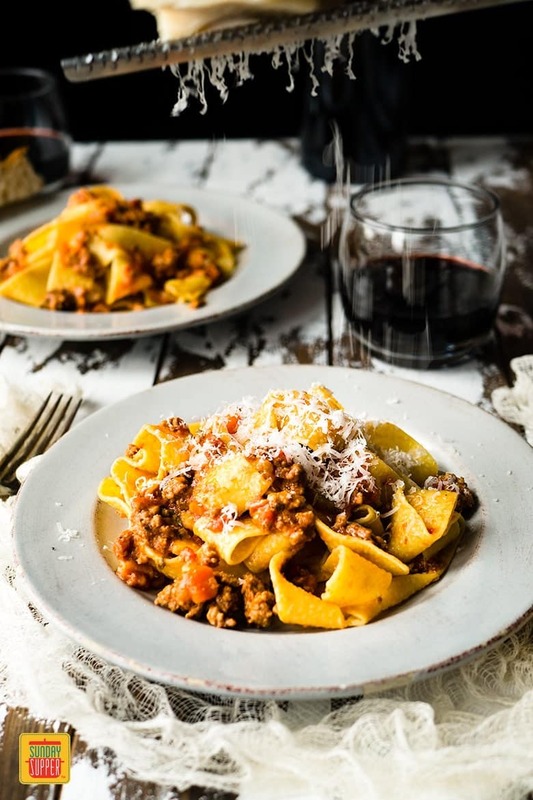 This pappardelle pasta with the best bolognese sauce consistently gets five star ratings from everyone in my family. All four of us. Do you have any idea what a miracle that is?!? No Joke Bolognese Sauce ~ No Joke because if you even attempt to eat it before the four-hour simmer mark the spirits of a thousand Italian grandmas will descend on you with their wooden spoons blazing. Better Than a Sweater Bolognese Sauce ~ Sweaters merely create a barrier between you and the chilly air. This sauce tho? This sauce warms you from the inside out AND makes your house smell like heaven. 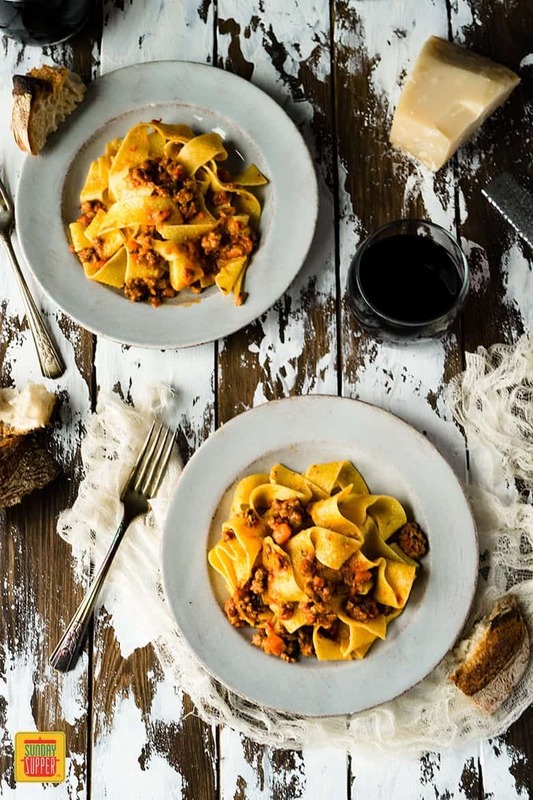 Why is this the Best Homemade Bolognese Sauce exactly? use a big enough pot that the various liquids will be able to almost entirely evaporate. In the end, the sauce should be mostly meat with a little bit of very thick tomato sauce holding it together. do your best to dice the onion, carrots and celery (the soffritto) as evenly as you possibly can. Go for the 1/4 inch dice. This is pretty much the only “work” involved in this recipe and the more exact you are the better it will be. there’s no parmigiano reggiano in the actual sauce but if you don’t grate some on top before digging in you’re senselessly depriving yourself. This is comfort food, after all. Another bonus to this recipe is that, if you’re a family of four (or fewer,) there will definitely be leftovers. And this bolognese sauce only gets better with age. Enjoy! 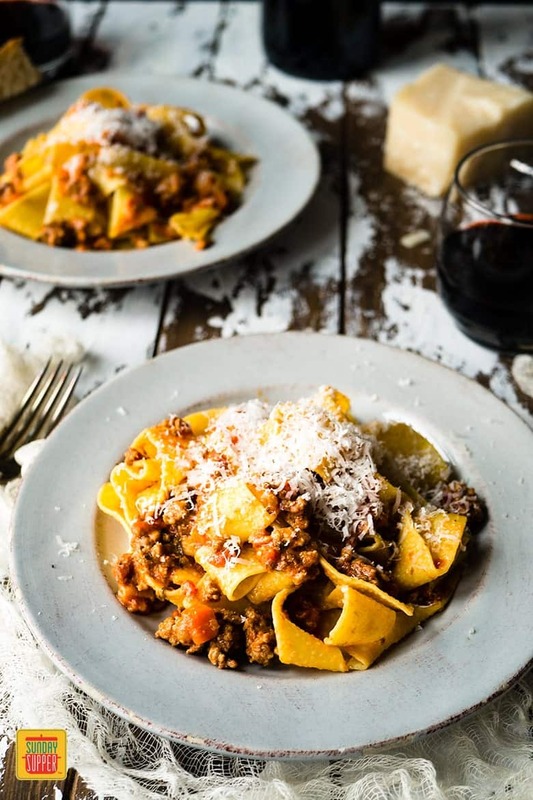 This Pappardelle with the Best Homemade Bolognese Sauce is one for a day when time is on your side. The wide noodles make the perfect vehicle for this rich, savory authentic Italian meat sauce. 28 ounce whole tomatoes peeled San Marzano tomatoes and their liquid. Tomatoes can be crushed by hand or cut up. 1 pound pappardelle pasta cooked according to package instructions. Melt butter in a large heavy pot or dutch oven over medium-high flame. Add onion, carrot, celery, garlic, tomato paste and 1 teaspoon of kosher salt. Saute, stirring frequently, for about five minutes. If the onion or garlic starts to brown reduce heat. Add pancetta and continue to cook, stirring frequently, until the vegetables are fairly soft. Add the beef and pork about a third at a time, allowing most of the liquid to evaporate before incorporating more. Cook, stirring frequently, until all the pink is gone from the meat, all the liquid is evaporated and you can feel brown bits starting to stick to the bottom of the pot. Deglaze the pot with the cup of white wine. Make sure you get up all those bits. Then lower the heat so it doesn't start sticking again. Add milk, broth, tomatoes, 1 teaspoon of kosher salt, a crack of freshly ground black pepper and bring to a boil. Reduce heat to as low as possible maintaining a very lazy simmer. Add bay leaves, sage and parsley. Simmer on low, half covered, for four hours, stirring occasionally. If the sauce has not completely thickened yet, increase heat slightly and simmer another 15 to 30 minutes with the lid off. Serve with pasta and a healthy dose of freshly grated parmigiano reggiano.